Brutalism: the design for the clover-shaped tower of Bertrand Goldberg's Prentice Women's Hospital in Chicago was enabled by the pioneering application of one of the earliest three-dimensional modelling programmes. With its curving form, Goldberg made a clear break away from the grid formations favoured in Modernist architecture. 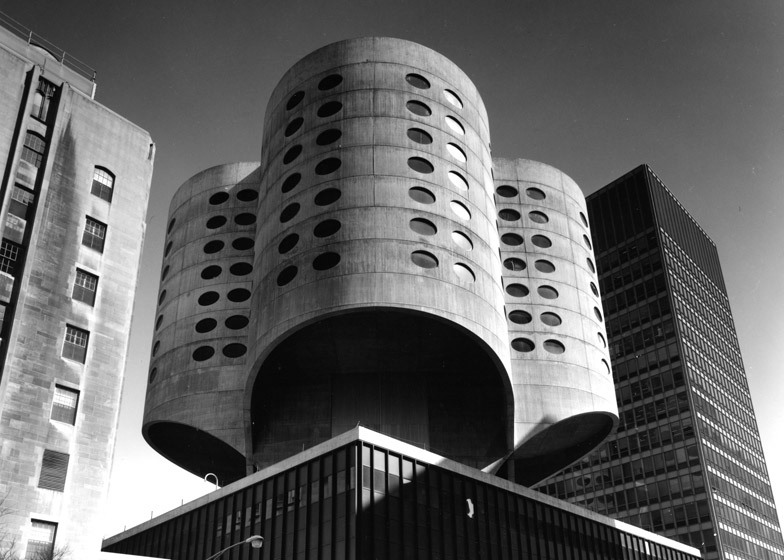 Completed in 1975, Prentice Women's Hospital was formed of a striking corrugated concrete tower that cantilevered off a central core, joined to a five-storey glazed base by four mammoth interlocking arches. The project required the adaptation of specialist engineering technology reserved at that time for large-scale dam construction and aviation design. The building housed the maternity unit of the Northwestern University campus in Chicago until its demolition in 2013 to make way for a new biomedical research centre designed by Perkins + Will. Goldberg began working on the design for Prentice in 1970 and considered several alternative schemes before settling on the formation of a five-storey glazed rectilinear platform topped by a nine-storey concrete quartrefoil tower. The concrete shell cantilevered off a central core, distributing the building's weight through four interlocking arches that radiated out from its centre, onto the five-storey podium below. "What I believe I have tried to translate into its many forms is the tendency of people to relate to each other," said Goldberg in an interview with Betty J Blum in 1992. "I don't think the box or the rectilinear form of architecture, which has been so prevalent in the last portion of the 19th century and the early half of the 20th century, was invented by the architects," he explained. "It was a denial of human difference. You might say it was also a denial of humanism, because to say humanism is to say that we're made up of lots and lots of different components and different objectives and different reactions." Bertrand made use of a specialist engineering technology called finite element analysis to design the arches. 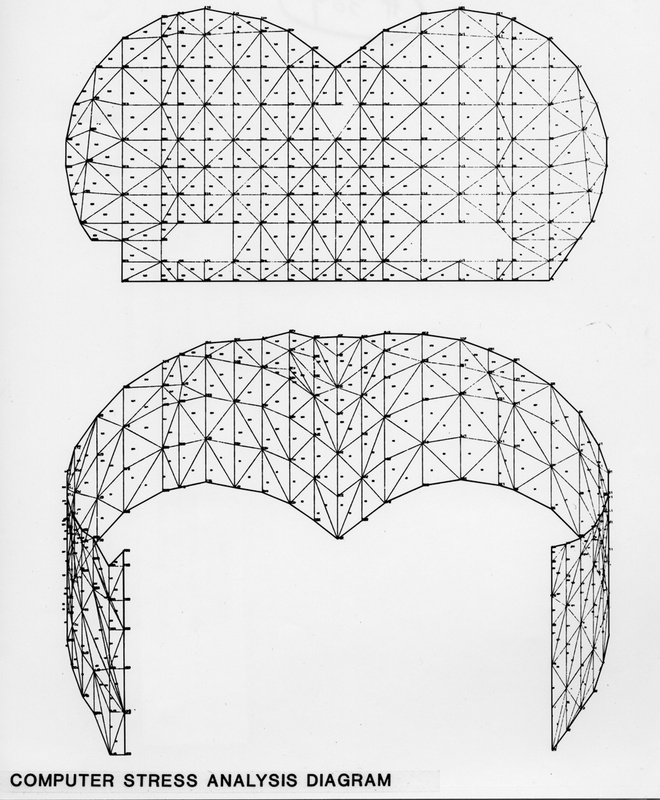 The system allowed engineers to determine the strength of individual elements of a structure and was widely used in the aviation and dam-building industries. Prentice is regarded as one of the first architectural applications of the technology and Bertrand won an award for the design from the Engineering New Record in 1975. In an open letter to Chicago's Mayor, Save Prentice – a coalition between the American Institute of Architects Chicago, DoCoMoMo, Landmarks Illinois, the National Trust, and Preservation Chicago formed when plans for the demolition of the building were unveiled – explained the importance of the technique. "Prentice propelled advances in the fields of architecture and engineering that are still recognised today," said the letter. "Its cantilevered concrete shell broke with precedent and remains unique in the world. The result created column-free floors that today allow great flexibility for reuse options. Upon completion in 1975, critics and engineers worldwide celebrated Prentice as a breakthrough in structural engineering." Like the "streets in the sky" of buildings by Le Corbusier and Alison and Peter Smithson, Bertrand's design was built around socialist principles, with a floor plan aimed at fostering a sense of community. At the topping out ceremony, the architect said the building had been "designed from the inside out". The innovative structure did away with the need for internal supports, creating a floor plan uninterrupted by columns. Each quadrant of the tower translated on the interior as a curved bay. The four bays on each floor opened onto a nurses' station that wrapped around the central core of the building. The fluted exterior form, dictated by the interior layout, was clad in curved sections of ribbed concrete that ran in horizontal bands around the tower. Columns of oval windows punctuated this facade. Prentice was one of eight American hospitals by Bertrand that take a similar shape – the precedent for Prentice was the Affiliated Hospitals in Boston, completed in 1971. But Prentice was the only hospital designed by the architect for his hometown of Chicago. Original room interior. Image courtesy of Geoff Goldberg. The building is often credited with being influential in the promotion of unified patient care, as it consolidated under one roof maternity obstetrics and gynaecology services that had previously been separated. The glazed five-storey podium also gave the building a dual purpose, housing the Northwestern Institute of Psychiatry. According to the preservation campaigners that attempted to save the building, its design "changed the course of modern hospital design". Original interior design model. Image courtesy of Geoff Goldberg. "His ideas for improving hospital design helped redefine patient- and family-centered care," said Save Prentice in a letter to Chicago's Mayor. 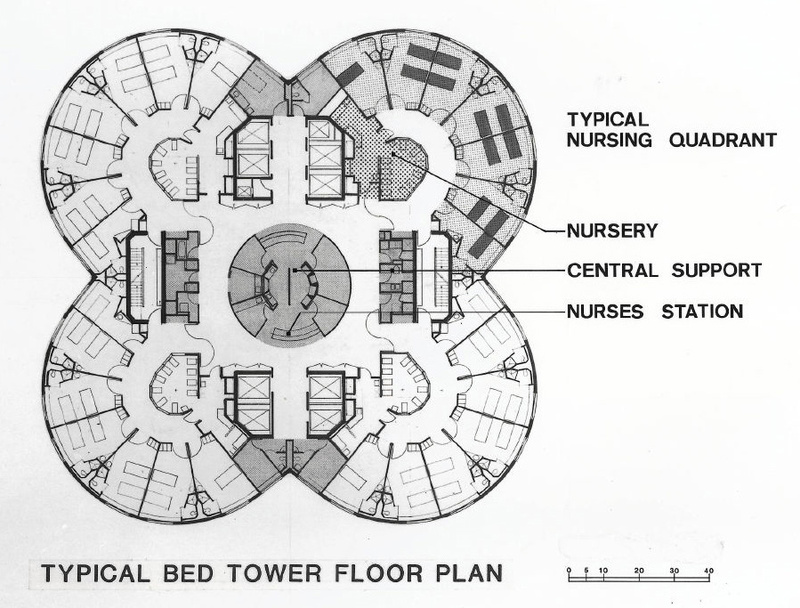 "Prentice's cloverleaf tower exemplifies the belief that patients should be grouped in communities around a nursing center, creating 'quiet villages' that improve proximity and sight lines between nurses and patients, welcome fathers into birthing rooms, and place mothers closer to their babies in the nursery." In 2010 the Northwestern University announced that Goldberg's building was to be replaced by a new biomedical research centre. The announcement sparked a campaign to have the building Landmarked – the US equivalent to the British Listing system. The campaign was led by Save Prentice with the support of several prominent architects, including Renzo Piano. Studio Gang’s founder Jeanne Gang also supported the campaign and proposed a new glazed tower to accompany to sit atop Bertrand’s tower. In a letter to Chicago council’s Alderman Brendan Reilly, Jeanne Gang explained the building's significance. "It is an artifact of an architect who literally thought outside the boxes that dominated his era and remains an inspiration to all who view it today," said Gang. Attempts to save Goldberg's building failed and in 2013 Perkins + Will architects won the bid to create a new biomedical research building on the site. Demolition work began later that year. The Perkins and Will design, like Goldberg's, features a tower that rises above a rectangular platform, clad in glass and steel. Construction begins in 2015.